Silver Surfer Vaporizers brings you a series of Wave Riders dedicated to the artists who want to share their designs with the world! This Wave Rider was designed by Jude Anaya, an artist whose works are all digitally painted primarily for musicians and venues. This digital painting is a mountain reflection on a cosmic view. Why choose a Silver Surfer? 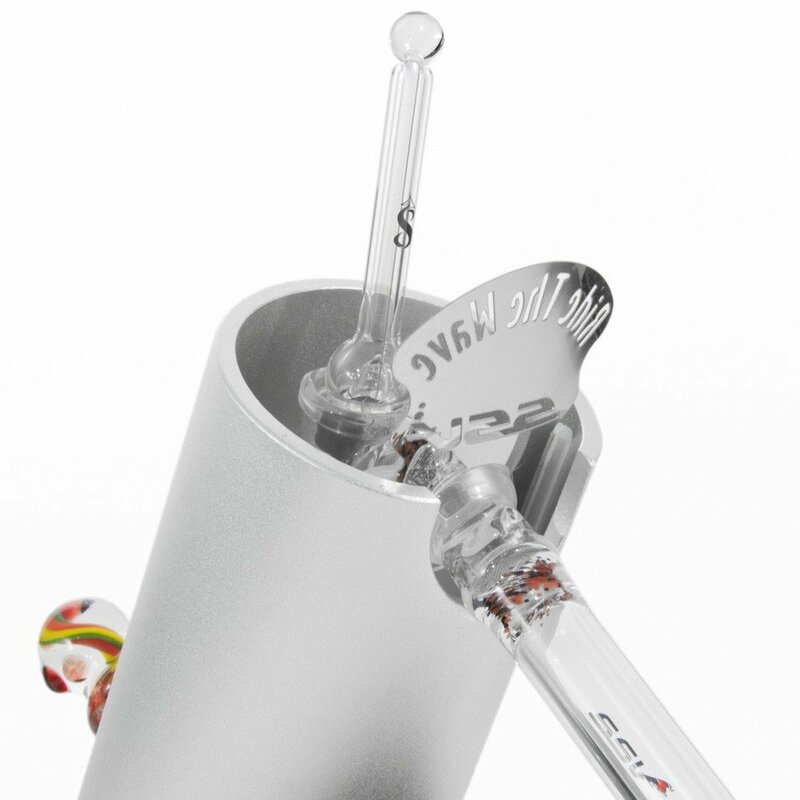 The Silver Surfer Vaporizer was the first vaporizer to employ a ceramic heater element and pure glass-on-glass air flow for the best possible flavor. And now, 100,000 units and ten years later, 7th Floor continues to dominate the desktop vape category with the SSV, noted for its simple operation, versatility and durable design. Each unit is assembled and tested by American workers - not in China or Germany or some nameless overseas factory - but hand-crafted in Colorado Springs, CO. Our talented staff of glass-blowing artisans provide the finishing touch with a custom made, hand-blown temperature control knob - ensuring that no two Silver Surfers on planet earth are alike. Padded Storage Bag made of a durable hemp and polyester blend called "hempster"
Turn your Silver Surfer Vaporizer into the ultimate e-nail! This kit comes complete with everything you'll need to have wonderful flavored vapor! The Heater Cover is open for easy access and comes with an oil cap from dropping in your concentrates, as well as a ground glass cap to close the pathway up for filling bags! To finish the kit off, there is a small titanium cap that sits on top of your heater cover. Just drop a ceramic flavor disc and some flavored oil on top, and enjoy that tasty vapor! This package is built just for the daily vaporist at a 30% discount from the full price. It comes complete with everything you need to get started vaporizing right out of the box! 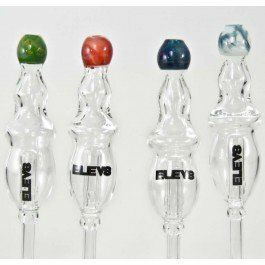 The Essential Oil Kit includes all of the pieces to convert your SSV into the safest and most reliable e-nail on the market, and the glass Switchball Ashtray and Striped Glass Pick provide the finishing touch. The Aroma Top will keep your home smelling amazing the entire time! How often do you clean your vaporizer and rigs? Is there anything better than a vaping experience with fresh, clean gear? We recommend that you replace the hose on your vaporizer and clean all it’s parts—along with any water filtration you use to ELEV8 your vaping experience—at least once each month. We’ve now made it even easier to have the cleanest, smoothest, most flavorful experience for dry herbs and concentrates imaginable on your Super Surfer, Silver Surfer and Da Buddha Vaporizers from 7th Floor Vapes with our new CONSUMABOX subscription plan. Get a dual hose wand to blow open a window of opportunity! 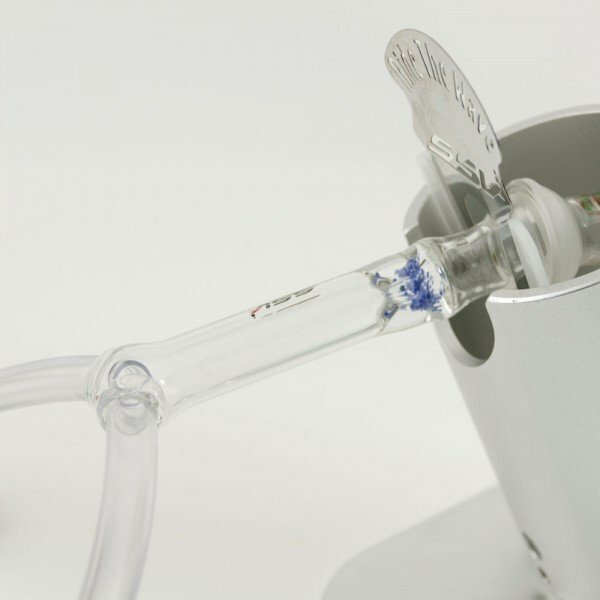 With endless possibilities, you can use it to fill a vapor bag while you continue to vape, connect it to two unique setups, such as an Elev8 Premiere Custom Water Filter on one hose and a Vapor Tamer with the other, or have super competitive vape session with your buddies, and more! For an inexpensive water filtration solution, look no further than a bubbler mouthpiece for your vape! You may have thought these mouthpieces were exclusive to the SideKick, but this awesome piece of glass has a mariah at the base of the bubbler to attach it to any hose setup!